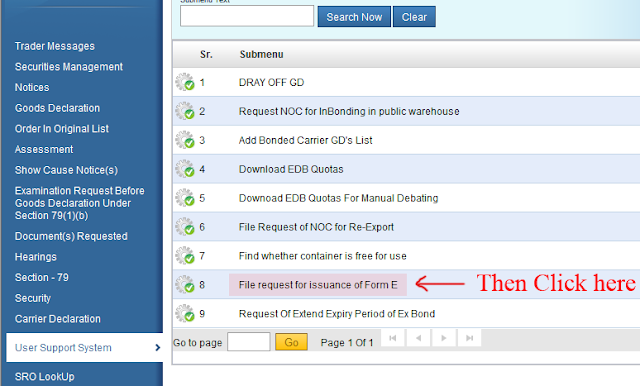 Do You Know, How Can You File Online Request For Form-E Issuance In Weboc? Or Get Form-E Number Online? In our last post we were informed our reader to get ready for the new filing mechanism of E form and today we are going to explain the complete procedure to submit a Form-E issuance request online in weboc and get Form-E No. using this new online Form-E issuance facility. Here we try our best to explain the process of filing Form-E through WeBoc as sample as possible so that an exporter can easily file online E Form issuance request in WeBoc. 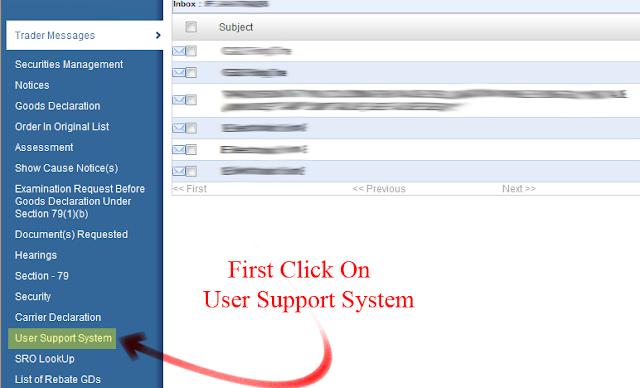 Firstly visit WeBoc`s website then we will log in using trader`s weboc id and password, once we logged in, so we reached on weboc home page, now click on the user support system as indicating in the image below. 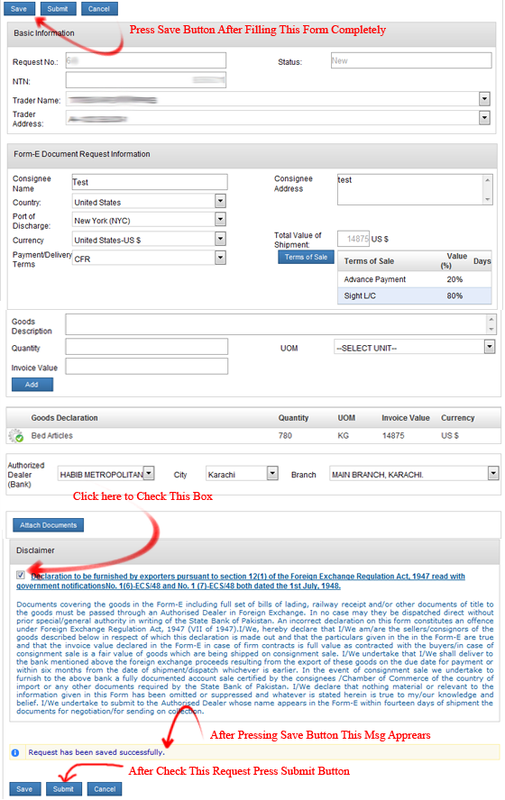 Here we will click on 8th option (File request for issuance of Form-E) and remember this option will only appear in the trader`s (Exporter) WeBoc ID. Once we enter into a file request for issuance of Form E option another page will show, where we can see the complete list of Form E request that we prepare or submit but here we are going to file a new request therefore, we will click on new request (as mention in image below). After pressing new request button, E Form request form open that we need to fill the basic information section, Form E documents request information section and goods declaration section. (i) Request No: Form E request no. automatically allot when we save this request form after completely filling. (ii) Trader Name: First of all we will select an exporter name from the drop down box. (iii) Trader Address: address automatically filled when we select the trader name. (i) Consignee Name & Address: Write complete name and address of importer (Consignee). (ii) Country: Select destination country where we want to ship our cargo. For example: United State of America, United Kingdom etc..
(iv) Currency:Here we will select currency. For example: USD, EURO etc..
(v) Payment/Delivery Terms: Select delivery term from here. i.e: FOB, CNF, CIF, etc..
(vi) Terms of Sale: Here we will declare our terms of sale that we mutually settle with buyer (Consignee). 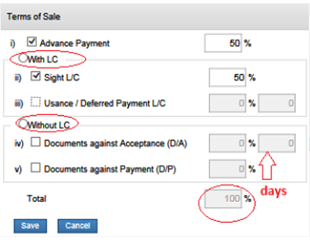 When we click on terms of sale button so some option will appear where we declare sales terms in percentage, but remember one thing total must be equal to 100. * 100% Documents Against Payment. (i) Goods Description: Write a complete description of goods, i.e. 100% Cotton Men`s Shirts etc. (ii) Quantity: Here we mention the total quantity of goods. (iii) UOM: Select Unit of measurement of shipment. (iv) Invoice Value: Write total Form E amount. Now, we will provide our dealing banks details here. First select bank, then the city where our bank exists and in last select branch, while selecting branch be careful because this request will send to your selected branch. Finally, we have successfully prepared online Form-E issuance request before we submit this request we will check everything again for any error or mistake, after checking now we will press submit button to send Form-E issuance request to bank. After submitting, the request automatically forwarded to your selected branch of the bank, They (Bank) will verify and approved your request, once bank approved Form-E issuance request so they will also issue a Form-E number that can be seen in your request in WeBoc (As indicating in image below) and that`s all. This tutorial can become more productive if you ask questions to clarify any confusion or doubts you may have in mind. This is the most detailed tutorial on creating form-e issuance request in weboc ever shared online, so feel free asking questions so that we may better assist you. All these tutorials are shared with a sole purpose in mind to better help the traders. I wish we succeed with this sincere help. Wish you all a good luck. Peace and blessings buddies! GD Filing Time In Weboc. How To Get DTRE Approval. Pakistan Customs Problems and Their Solution. Create Export GD in Weboc Video Tutorial in Urdu. How to Claim Rebate and what documents are required. How To Clear Export Customs In Pakistan – Complete Procedure.